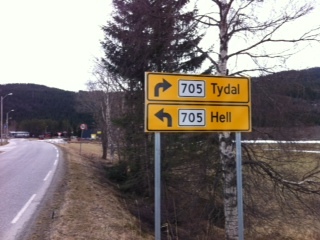 On the road to Hell…? Today I am having a day of rest. Yesterday I walked alone and let Peter rest, today I am resting. And what did I do on my day of rest? Well, I went on a promenade… And I came across this sign. I had to turn right, but I must say that this country is heavenly beautiful wherever you go. I am grateful that my body is responding as it is has been so far. Surely this could be a road to hell with a body who doesn’t want to follow. And there has been alarms in both back and knees lately. Our track profile shows that we are climbing to the summit of our trek during the second week and then there is basically four months of downhill with a small exception of Småland. The fact that due to the snow in the forests we cannot use the small paths but have to stay on the bigger roads means also that we are walking mainly on tarmac. Man has made tarmac but he is not made for tarmac. It gets you. Right in the knee. So walking during my day off is a good sign. A sign that Hell is nowhere and Heaven is now here!